Rainbow Riches Reels of Gold slot comes under the banner of Scientific Gaming which has absorbed renowned developers like Barcrest and WMS. You will probably recognize the format from WMS games such as 'Kiss' which have a similar layout. You have a 5-reel 4-row slot on the left and a 5-reel 12-row slot on the right, known as the 'Colossal Reels' format. Any full-reel Wild landing on the smaller slot will replicate to the corresponding reel of the larger slot on the right (It's a lot easier to understand with a few spins of the slot to be honest). Exciting new version or tired old theme? 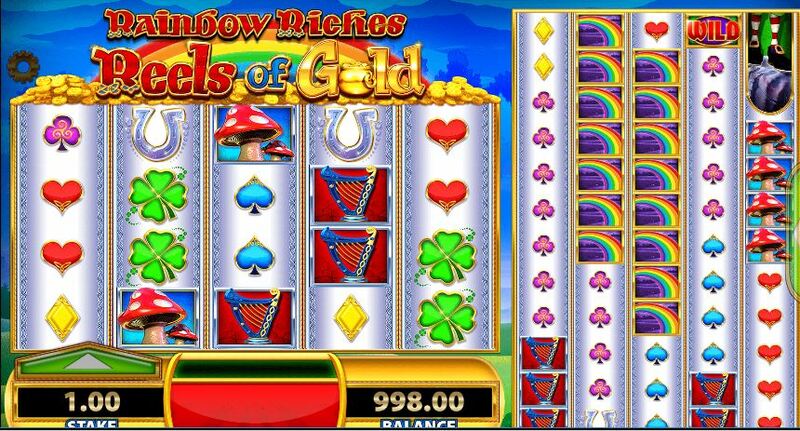 Rainbow Riches started life in land based casinos and was a huge hit. So much so that Barcrest made sure Rainbow Riches was one of the first slots in its portfolio to be released online. It was later followed up with a few adapted versions, but players seemed to always return to the original version. Since the aquisition of Barcrest by Scientific Games in 2011 there has been a renewed effort to release more spin-offs of this hit theme, with Reels of Gold one of a few Rainbow Riches titles released in 2016. What we are trying to work out is whether this is a clever use of a very popular theme or a sign of laziness from the development team? The lack of much else being released would slightly lean towards the latter suggestion, but what do we know? In the Reels of Gold version of the slot the expanding Wilds don't multiply and are the Rainbow Riches symbol itself. There are 100 paylines in total and all symbols appear stacked. The familiar figure of the leprechaun is the highest-paying symbol awarding 5x stake for 5-of-a-kind (5OAK) followed by the rainbow at 4x stake for 5OAK. This is the result of having so many paylines and stacked symbols though. Magic Wilds - stacks of wilds will appear on the reels and move up and down until coming to a stop, hopefully in the right place. Butterfly Wilds - a swarm or butterflies appear from the fairy's wand to populate random reel positions and turn them wild. Magic Symbols - all card symbols (A,K,Q etc.) will turn into wishing wells and then reveal an identical symbol underneath. Reel Win Multipliers - any win appearing on that spin will be awarded either a 2x, 3x or 5x multiplier. Super Wild Stacks - random extra expanding wilds may appear on the small slot, fill the reel and then transfer to the same reel on the colossal slot. Balloon Bonus - if 2 balloon scatters appear (you need 3 to trigger the free spins bonus) the fairy will add another to get you three or more. Reel Win Shuffle - the fairy may move the reels up and down in order to line up the symbols for a win. Balloon symbols appear on reels 1, 3 and 5 on both slots. 3 balloons anywhere awards 1 pick, 4 gives 2 picks, 5 gives 3 picks and all 6 gives 4 picks. You get at least 5 free spins and they can be retriggered. During free spins the enhancement is that wilds on the smaller slot expand to fill the reel, therefore will transfer to the colossal reel set. In the base game the wild needs to drop in all 4 positions. As most paylines appear in the colossal set, this is the best chance to achieve a decent hit. As with many Barcrest slots you can pay extra and 'buy' the enhancements. Here you can choose 10x, 15x, 20x or 25x stake to 'purchase' the features and attain the bonus round more frequently. You get 5 spins and get expanding wilds on all levels. As you bet up from 10x to 25x stake the 'Bonus Trail' gets shorter. This means any scatters fill a trail up in the 5 BB spins. You need to collect 8 betting 10x stake and only 5 betting 25x stake. You also get to pick higher free spins quantities. At 25x stake should you collect the 5 scatters in the 5 spins and thus get to pick free games, you get from 50-100. The random in-play features also occur ever few spins too. This also affects the RTP. Playing the max 25x stake results in a 98% RTP but it is 94% should you play it 'normally' for 1 unit a spin. Graphically the slot is superb, but as with all Colossal Reels games, the wins are frustratingly small. For example, a relatively small 50x stake win in base game play would take a hell of a lot of spins. Personally I do not like this Big Bet feature in this game and many other titles coming out of Scientific Games. You are encouraged to bet silly amounts to overcome the tedium of waiting for the various features to arrive at a 'normal' stake. The RTP also favours this excessive staking, which seems a bit of a unnecessary lure. I have tested this game for a while and you would be fortunate to multiply your 25-unit stake by more than 25 even if you get the max 100 free games in 25-BB mode. The variance is simply too low to make it interesting despite the abundance of features. Playing Rainbow Riches: Reels of Gold slot in either 'normal' or BB mode made me relate my balance to that of a an egg timer - the sand never increases, it only fall away.